Defect stories in the media sending a shiver down your spine? Experts are saying that Sydney’s Opal Tower case is just one of many buildings nationwide suffering from poor building standards and defective products slipping through the cracks. That can be a really concerning narrative for apartment owners like yourself, but to give you some peace of mind, here’s an action plan for raising concerns and having them addressed quickly in your community. Complaints about meeting contract conditions or payment disputes. Don’t waste time - liability periods can expire quickly. For example, in QLD.. If your contract was entered into prior to 10 October 2014, you must lodge a complaint within 3 months of noticing a structural defect that appears within 6 years and 3 months from practical completion and you have up to 7 months after practical completion to lodge a complaint for non-structural defects. And in NSW, For major defects the time in which to claim statutory warranties is 6 years (with a 6 month extension if a building defect becomes apparent during the last 6 months of the statutory warranty period) or for non-major defects owners of the building have 2 years (with a 6 month extension if a building defect becomes apparent during the last 6 months of the statutory warranty period) to report defects. Strata managers are your asset in situations like these. The ability to navigate legislation, understand the timings of when complaints need to be made is crucial in getting the result you want and that’s why strata management is so important. It is important to note however that whilst all common property defects are to be reported to your strata manager, all internal lot defects are to be reported directly to the builder. The strata manager is on hand to pass reports of common area defects on to the builder, along with all other common property defects notified to them by various owners/residents. In the event of private lot defects, see if issues can be resolved without involving a third party. Make sure that all defects are clearly outlined and documented. Give the builder a reasonable length of time to respond and begin repairs. If issues cannot be resolved with the builder, take it before the relevant authorities in your region. The purpose of taking it further and contacting an Office of Fair Trading, Consumer Affairs Department or Civil Tribunal is to assist with dispute resolution. Either you or the trader can formally request for Fair Trading to assist, but both parties need to agree to the attempt at resolution. The purchase contract and the pre-purchase inspection reports. Disclaimer: This is not advice and should only be referred to for general information purposes. Strata management contracts often vary, so we recommend you contact your local Ace manager for more information, or seek expert legal advice. 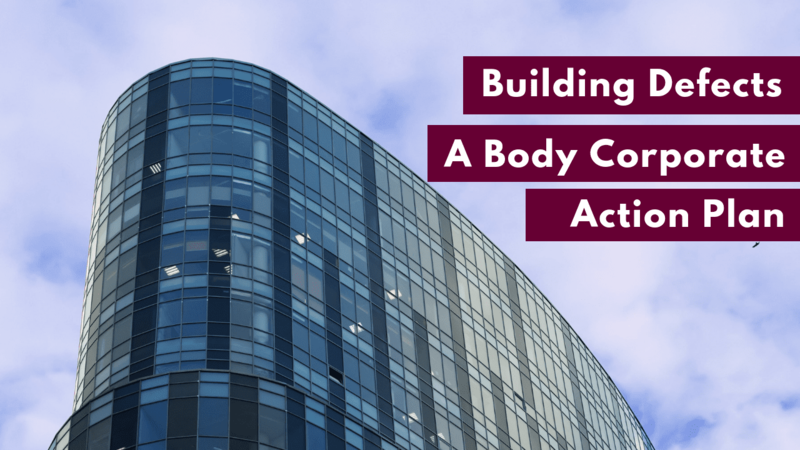 This article is not intended to be personal advice and you should not rely on it as a substitute for any form of advice.Ace Body Corporate Management offers this newsletter to clients to assist in updating them on company and industry news. The content within this newsletter is of a generic nature and may not be applicable to all owners corporations. Ace Body Corporate Management attempts to provide the most up-to-date and accurate information for our clients, however we strongly recommend that individuals and committees seek further advice before acting on any information in this newsletter.